Translation from Tetum: Suara Timor Lorosae 20 October 2009 Timor-Leste Sending Back Maternus Bere; Lucia: Timorese should not oppose it. Dili – President of the Republic Jose Ramos Horta, has already decided to return former Commander of the Laksaur militia Maternus Bere, to Indonesian authorities because he suffers from a complicated medical condition. “I have made this decision so that there is no impact for the State of Timor-Leste, based on medical advice that Maternus Bere suffers from a condition that is a bit grave,” PR Horta told journalists this at the Comoro International Airport, Dili, on Monday 19 October 2009, as he was about to travel to participate at President SBY’s swearing in ceremony. He said, that due to his medical condition, Timor-Leste had no reason to block the process to return Maternus Bere to Indonesia. “I do not want Maternus Bere to die in TL, because if he dies here we will be suffer serious consequences from Indonesia. Because of this, the government has to immediately resolve to return him to Indonesia for medical treatment,” PR Horta said. He confessed that before the state decided to hand him over to Indonesian authorities, according to the opinion of two doctors, one from Indonesia and one from Timor-Leste, Maternus suffers from diabetes and other medical conditions. The reason the State decided to hand Maternus over to Indonesian authorities was so that he could get medical treatment, because failure to do so, Maternus could die. “If he dies, we will be responsible,” he stressed. The Nobel Peace Laureate promised to raise this case of the State of Timor-Leste deciding to free Maternus Bere with Indonesian President Bambang Susilo Yudoyono (SBY). “When I am there I will speak with the Indonesian President who understands our situation on the Maternus Bere case,” he said. Responding to reports of threats made by Timorese born Indonesian citizens to undertake searches or sweeps of vehicles with white Timor-Leste number plates because of the Maternus Bere case, PR Horta said that the Indonesian people will not do this because the State of Timor-Leste will release Maternus Bere. PR Horta considers these reports of threats by Indonesian citizens as rumors only, because the Indonesian State will guarantee that it will not happen. “I believe the situation will remain calm because they also understand our problem and that they cannot pressure us too much,” he said. Deputy Prime Minister Jose Luis Guterres, who was also there with him, said that the government has agreed to let Maternus Bere return to Indonesia for medical treatment. But the decision would be made upon Prime Minister Banana Gusmao’s return from China. “PM Xanana will be the one to make that decision on this case,” Jose Luis stressed. The Acting PM has already advised the President of the National Parliament Fernando Lasama Araujo regarding the medical condition suffered by Maternus Bere. In the meantime, Justice Minister Lucia Maria Lobato, said that now she was waiting for the lawyers to process Maternus’ return to Indonesia. Lucia appealed to judicial authorities and political leaders not to oppose or criticize the State’s decision regarding the freeing of Maternus Bere, because when political leaders criticize one another without looking for solutions, Maternus Bere can end up dying in Timor-Leste. The Justice Minister acknowledged that Maternus’ medical state is grave because he has been under great pressure for two months whilst staying at the Indonesian embassy. “We all have to see that this case will affect us all, and is of a national interest. If we do not want to make an effort then we will be held responsible. Because we have to think about whether this case will end up creating difficulties for our people on the other side of the border,” Lucia commented. 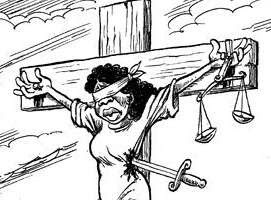 Image added by ETLJB: Lady Justice's situation in East Timor takes a turn for the worse.